The news that several plaques honouring Canadian veterans had been stolen from a Riverside Drive memorial was heartbreaking. The plaques and Canadian flags were installed by the Veterans Voices of Canada as part of their National Flags of Remembrance project. However, when plaques started to go missing from the memorial, they were removed in order to preserve them. Our Digital Librarian Julie came up with the terrific idea of offering space at the library to house the memorial plaques. 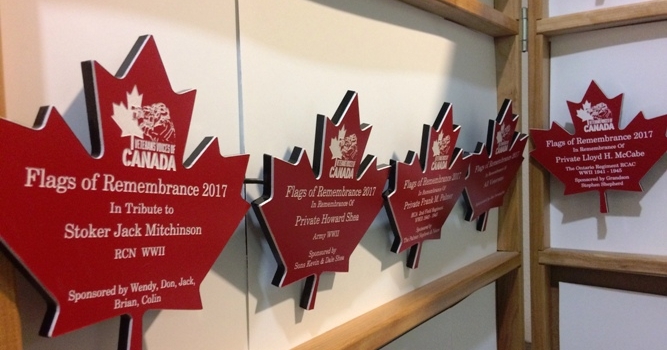 Terri Fitzpatrick-Davis, the local coordinator of the project, agreed that this would be a great way for people to view the plaques, and remember and honour our veterans. The plaques are now safely displayed behind glass, allowing us to pay homage to those who sacrificed for us. The plaques will be displayed at the Central Branch, 850 Ouellette until November 16, 2017. More information can be found here, including how to donate to the project.